Develop analytical and critical thinking skills. Interpret literature and culture. Write for professional contexts. As an English major, you will be prepared for a variety of careers and experiences! The English major offers three exciting concentrations: Literary and Cultural Analysis, Professional Writing, and Professional Studies in Secondary Education, English Concentration. As you acquire skills in writing and build knowledge of literature and culture, you will gain a unique understanding of life and society as well as a competitive edge in today's job market. Follow English and World Languages for the latest news and photos! For specific course and program requirements, please consult the undergraduate catalog. The Literary and Cultural Analysis Program is designed to introduce you to textual analysis. As you hone your interpretive skills, you will acquire broad knowledge of literature and culture, study authors from diverse backgrounds, situate literary works in context, apply critical methods, and develop strong research and writing skills. Completion of the Literary and Cultural Analysis Program prepares you with highly marketable research and writing skills. Our graduates pursue careers in advertising, banking and finance, business administration, content marketing, copy editing, education, freelance writing, game design, government service, health care, information technology, Internet marketing, journalism, law, media, publishing, real estate, sales, social media management, technical writing, and Web development. Several of our graduates also pursue advanced degrees. This program provides you with a firm foundation in literature and culture. It includes coursework in American, British, and world literature as well as diversity, literary theory, and focused study of a genre or author in context. Many students add a minor in Professional Writing or Creative Writing. The Professional Writing Program is designed to help you write for the workplace. As you prepare for a career in any number of fields, you will learn to write effective reports, correspondence, and grants, as well as develop content for the Web and social media. You will also gain valuable experience job searching, interviewing, copyediting, and designing print and media. Completion of the Professional Writing Program prepares you with highly marketable writing and research skills. Our graduates pursue careers in advertising, banking and finance, business administration, content marketing, copy editing, education, freelance writing, game design, government service, health care, information technology, Internet marketing, journalism, law, media, publishing, real estate, sales, social media management, technical writing, and Web development. Several of our graduates also pursue advanced degrees. This program provides a firm foundation in writing. Courework includes professional writing, writing for the Web and social media, and copy editing. The Bachelor of Science in English Education Program is currently housed in the Department of Education at Mansfield University. For more information about this program, view the B.S.Ed. Professional Studies in Secondary Education (with an English Education Concentration) page. Presentations and Prizes: Our students frequently present at conventions all over the United States! For details about upcoming conferences, the proposal process, submissions, or other opportunities, speak with an English and World Languages faculty member. 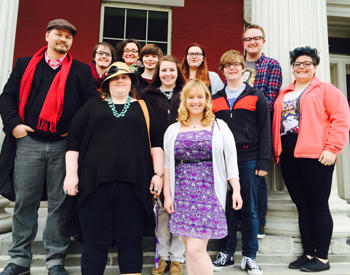 During the past 10 years, MU English majors have delivered 79 papers at undergraduate research conferences. MU English majors have won the North Hall Prize for outstanding research papers 5 times since the prize’s creation in 2009. In 2012, two MU English majors won prizes for their essays at the annual convention of Sigma Tau Delta, the international English honor society. In the past ten years, MU English faculty have delivered 93 papers at scholarly conferences and published 6 books; 64 scholarly articles; 94 poems, short stories, essays, and reviews. If you are a high-achieving student, Mansfield's local chapter of Sigma Tau Delta, the international English honor society, offers you an opportunity to participate in academic, extracurricular, and community service endeavors that will enrich you in a variety of ways. Membership includes opportunities to apply for scholarships, attend and present work at conferences, and publish work in the organization's scholarly and creative journals. To qualify for membership, you must be enrolled at Mansfield as an English major, an English minor, or a creative writing minor. You must also achieve a 3.3 grade point average and have completed at least three semesters of college. For more information, contact advisor Dr. Andrea Harris at aharris@mansfield.edu. English majors are highly sought after in today's job market, especially because of their strong "soft skills" in writing, analysis, and research. Many of our graduates pursue careers in advertising, banking and finance, business administration, content creation, marketing, copy editing, education, freelance writing, game design, government service, health care, information technology, journalism, law, media, publishing, real estate, sales, social media management, technical writing, and web development. A practicum is 1-5 credits and geared toward students who want to add a work experience to a mostly full course load. 1 practicum / internship credit = 40 hours across a 15-week semester, so a 3-credit practicum means working 8 hours a week. Prospective students should have a 3.25 overall GPA or 3.5 in the major. An internship is 6-12 credits and for students who want to spend half or all their semester working. A 12-credit internship would mean working 32 hours a week. Prospective students should have a minimum 2.5 overall GPA. A signed agreement in place between the site and Mansfield University. A job position including description of duties. See the department chair for current opportunities. A work schedule you create in coordination with your Site Supervisor. A Faculty Advisor, who will oversee the academic side, meet with you regularly to discuss the experience and help you resolve problems, and arrange one or more site visits. Academic work: typically, a time log, progress notes, job artifacts, and a portfolio. At the end, you will earn a grade, just like any other course. We strongly recommend that all qualified junior and senior English majors undertake a practicum or internship (you may only choose one). While most are unpaid, both offer the opportunity to gain valuable work experience. Employers also prefer college grads who have completed practicums and internships. Below are some success stories from Mansfield University English majors. In Spring 2017, Adam had a practicum with The Arc of Chemung. The Arc was founded as a nonprofit in 1953 to meet the needs of people with intellectual and developmental disabilities in the Chemung County, New York area. The organization aims to provide quality support and increased opportunities via education as well as community acceptance and participation. In his practicum, Adam researched housing options in the Elmira area and used Microsoft Office, SharePoint, and other resources to create an online housing manual in clear language that is user friendly for people with special needs. He also researched and compared similar sites. The focus of Alison's Spring 2017 practicum was on improving Mansfield University's web presence. Over the course of the semester, Alison worked closely with colleagues to expand her skills in web writing and digital media editing. She also performed usability testing with three groups (current students, faculty and staff, and prospective students) and studied their interactions with the Mansfield University website. She submitted reports to Marketing and also presented her key findings at the annual Showcase of Student Scholarship. In Fall 2016, BA English major Kylie Ortity had an internship the semester with the Make-A-Wish Foundation. The goal of the organization is to grant the wish of every child diagnosed with a life-threatening medical condition. On average, a wish is granted every 34 minutes in the United States. In her full-time internship, Kylie worked with events staff preparing for events and silent auctions. She also prospected donors from the Mid-Atlantic area, which includes all of Maryland, Delaware, and Northern Virginia. In Fall 2016, BA English major Lyss Trostle had a practicum in MU Marketing. She commented, "I copy edit documents and the website for the university, including the style guide and department web pages. This practicum has helped me develop skills in copy editing and has improved my writing abilities. Being an English major with a concentration in Professional Writing, the practicum directly relates to my major and has prepared me for a potential career in copy editing." In summer 2016, Kate Haywood had a Copy Editing practicum in MU Marketing. Her responsibilities included copy and content editing of existing documents, publications, and web information. She reviewed information for grammar, spelling, clarity, and message cohesion tied to the university’s mission, vision, Academic Promise, MU2020, and marketing campaigns. She drafted copy for new projects, edited and presented materials, and rewrote content as necessary. Her other duties included preparing correspondence for internal and external entities; scheduling meetings; conducting research; seeking story information from the campus community and storyboard material; and performing office duties, such as scanning and filing. In Fall 2015, Melissa Walker had a practicusm with the Tioga County Partnership for Community Health. She attended workgroup meetings, recorded and transcribed minutes, assisted in website development, and created materials that showcased the organization's value to the community. She even helped create a new mission statement for the Be Your Best You workgroup! "My time spent with the Partnership has been extremely valuable," commented Melissa, "and I can confidently say I’ve successfully assisted the Partnership with its goal to promote and improve the health and wellbeing of Tioga County." In Fall 2015, Paige Kisner had a practicum with author Nancy Rue. Paige assisted Nancy by doing research, posting blog entries, and testing soon-to-be-released courses. Paige also created a Facebook page for Nancy’s anti-bullying campaign and created content daily for 20 weeks. Kirsten describes her internship: "As an English Education major looking to supplement the “teaching” part of my education, this summer  I’ve been doing an internship with Mountain Home Magazine, a local publishing company based out of Wellsboro, and I’ve been having a fabulous time! I never realized just how many steps are involved in getting a document put together and put on newsstands. The laid-back atmosphere suits me, and the editors and staff are extremely knowledgeable about publishing programs, sales and distribution, and journalistic writing. Everyone here has gone out of their way to guide, teach, and assist me in assigned tasks like copy editing, using publishing programs, the interviewing process, and, of course, writing, which has undoubtedly been my favorite task. I’ve been able to apply the writing skills and literary knowledge I’ve learned from Mansfield University English professors to my writing assignments, and I’ve received very encouraging feedback. The best part about my internship thus far, I must say, has been seeing my work in print for the very first time. I would highly recommend that English students, both BA and BSE, take advantage of an internship with the folks at Mountain Home, or with any publishing company for that matter, because the knowledge and experience gained will be an invaluable experience." Katherine describes her internship as follows: "During the summer of 2005, I interned at Penguin Books in New York City for precisely ten weeks, and I’ve got to say that it was the most rewarding educational experience of my life. I worked for a senior editor, and my job mostly consisted of reading unsolicited manuscripts and rejecting or approving them. Of course, there were parts of my job that weren’t so glamorous. Making copies of 400-page manuscripts, delivering contracts to different departments, running errands in general--these are the things that people typically don’t mention when they’re bragging about their job. I didn’t mind them, though. I viewed them as my part in helping a well-known and respected publishing house run. All in all, I would recommend that any student do an internship in publishing or otherwise. You learn how a business works. You’re exposed to a world that’s completely different from the collegiate one and asked to function in it. But most of all, you learn more about who you are and what you want, and any experience that can show you something more about yourself is definitely worth doing." Learn more about Mansfield University's English Program!